September 5, labor Day weekend over all ready. Fall is coming fast. Everyone getting stuff together for the Holiday cards? I'm just starting. All embellishments, paper and card stock is from my stash so I do not have all the names of the companies. 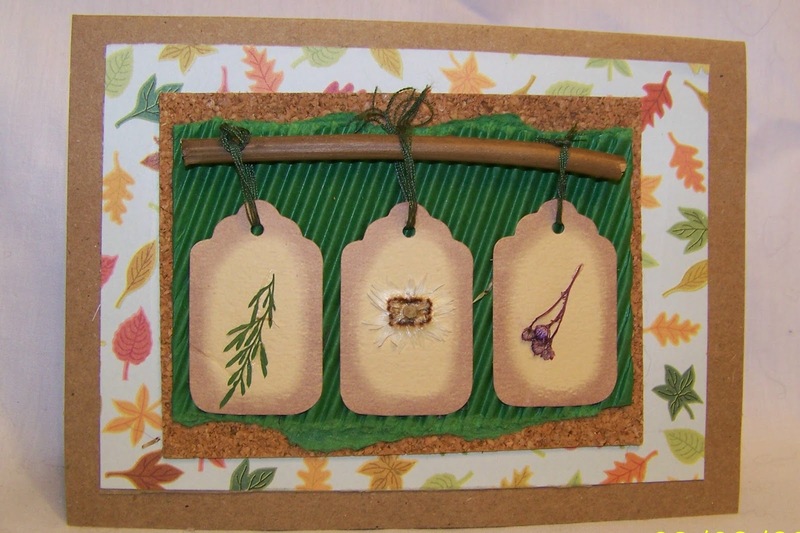 For Just-a-Scrappin' Color challenge using Fall Seasonal colors here is what I did. 1. I used a kraft A2 card base. 2. I cut the leaf patterned paper for the mat. 3. Using Tombow adhesive applied mat to card base. 4. I used fall embellishments from my stash for the center again using Tombow adhesive. Oooo so super cute. I love tags on card. Oh, and the cork...LOVE it! Great card-love the cork and the tags! Love your papers also! Great card, Sherry! The fact that you created it using much loved products from your stash...even better! Thank you for the inspiration!